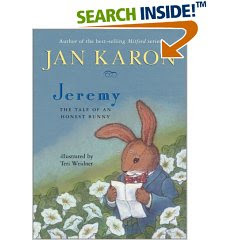 Amazon reviewers chalk Jeremy up to being the next best thing since The Velveteen Rabbit. It IS a good book but . . . well. . . perhaps my imagination just wasn't clicking with it. It IS a cute book and I'm glad that I bought a copy. I imagine that it will lots of fun to read to our little guy once he's old enough to follow short chapter books. The story was written by Karon for her daughter, Candace Freeland. It's the story of a little bunny who was hand-made in Ireland specifically for a little girl in America. He doesn't wish to travel by box to get to young Candace and decides to get there in his own way. The illustrations are too cute and I would like my own little stuffed Jeremy-bunny with silver buttons! It's cute but not that cute, and adorable but not that adorable. A worthy read, I suppose, but I'm not turning somersaults over it just yet. I'd say you've written an honest review! The weird thing about the title of the book was that it didn't really reflect the story, I felt. There weren't any real issues with honesty. It felt like a disconnecting bed-time story. I felt the book was a let down. I was so hyped-up (from reading the Mitford series) that I just knew this was going to be one of the best children's books ever. It just wasn't...nothing memorable in my opinion.